Everyday meals to fix for your family. How to eat well at home. These are also good menus to use if you are having guests for dinner. I haven't been on this page in a while, but now that I am doing intermittent dieting, I don't have to be as strict with my diet. 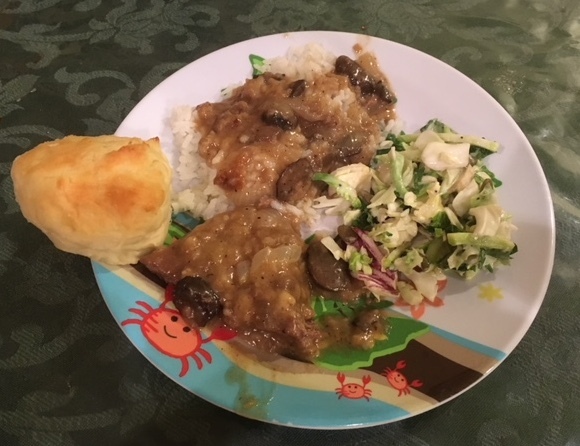 The Swiss steak is from my Family Recipes for all occasions cookbook. It is so tasty. 1 C bouillon (store bought or dissolve a teaspoon or cube of bullion in boiling water. Melt butter, ad onions and cook until translucent. Set onions aside. Cut steak into serving size pieces. Season with salt and pepper and pound the flour into the steak. If you don't want to do this, you can buy tenderized meat and dredge it in the flour. Brown meat well on both sides. I sprinkle any excess flour on top as the meat browns. Put onions on top of the meat and pour on bouillon and worcestershire sauce. Cover and cook slowly for one hour. Add mushrooms with liquid. Cover and cook for 30 more minutes. Remove meat from the broth. 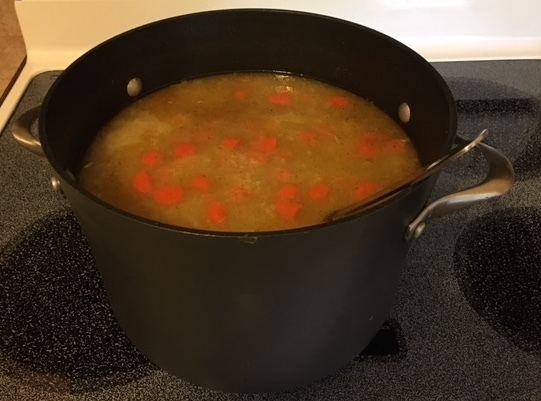 If necessary, thicken the broth with a tablespoon of cornstarch blended with a tablespoon of water. Simmer to thicken and spoon over steaks in serving dish. Just add a fresh roll and salad. I also added fresh steamed rice to the meal. It is lovely with the gravy spooned on. Baked potatoes would also be a good addition if you didn't want rice. The Kale salad above is found at most grocery stores. 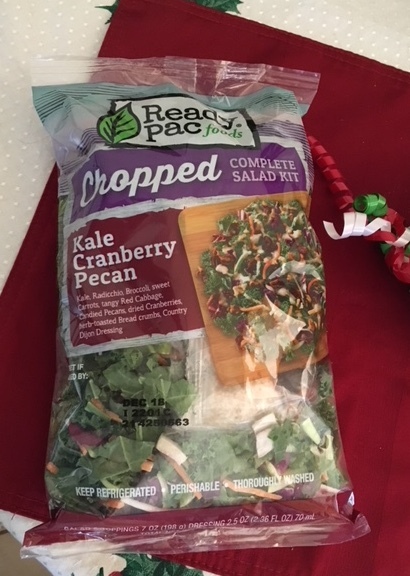 It has the dressing, cranberries, and pecans included. This brand comes in many flavors and they are all good. Just look where the bags of salad are found in the produce section. 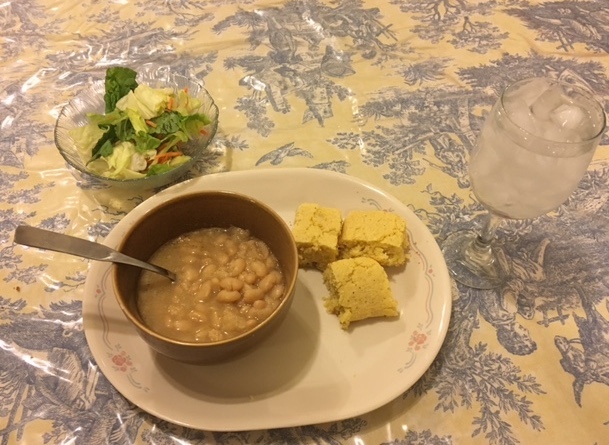 Great Northern white beans with salad and pineapple cornbread. Loaded with fiber and nutrients. A tasty, filling meal. This is so easy to make. I simply put the beans into a large pan and brought them to a boil. Once boiling, I reduced the heat to get a slow boil and cooked the beans for one hour. At the end of that time, I turned off the heat and put a lid on the pan. Let is sit for two hours. Add your favorite seasoning. We added salt and pepper and creole seasoning. You can also add ham hocks or other vegetables. Carrots, peppers, cabbage-anything you like. Then turn on the heat and simmer until they are done which is about 2 more hours. Add a bowl of salad and a glass of your favorite beverage. For pineapple cornbread, click here. 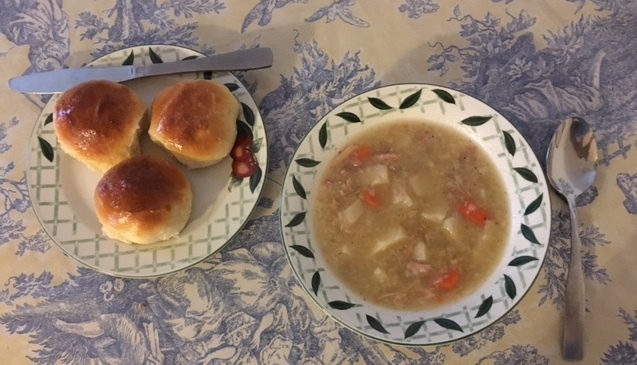 soup and rolls to warm the body on a winter afternoon or evening. What do you do with a leftover turkey carcass. There may still be a bit of meat clinging to those bones. Don't throw it away. The wonderful soup you see above started from a turkey carcass. It is easy to make and good to eat. Break the carcass in a few places so that it will fit in your pan. Cover with water and simmer for about three hours. Then remove the carcass and let it cool so that you can handle it. Remove any meat and chop it for the soup. Now discard the bones. a little Tabasco Sauce if you want pizzazz. Optional: feel free to add chopped cabbage or some of your other favorite vegetables. Add extra chopped turkey meat to your soup if you like. Put all ingredients into the broth and simmer until vegetables are tender. My family used to call this garbage soup because it was made with leftovers. This is so easy to make. First, purchase a roast that is right for the size of your family. This roast had fivebones and fed six people easily. There was even a little left for a midnight snack. Brush the roast with olive oil to coat well. Then pat on your favorite rub. Put the roast in a 425 degree oven. Cook it for about 20 minutes, and then turn to brown the other side for about 20 minutes also (kitchen tongs are good for turning roasts). Then reduce the heat to 325 degrees and cook for 75 to 80 more minutes. Put on a cutting board and cut between the bones. An electric knife makes this easier. While the meat is cooking, wash as many small potatoes as your family will eat. Brush the potatoes with olive oil and season as desired. put them in a foil lined baking dish. The potatoes are small and it only takes about fifteen minutes to cook. While meat and potatoes finish cooking, put a tablespoon or two of olive oil into a skillet. Wash the asparagus and cut it into thirds. I only use the top 2/3 of the stalks. Put the asparagus into the heated olive oil and cook stirring occasionally. Season as desired. We use a little salt and pepper. 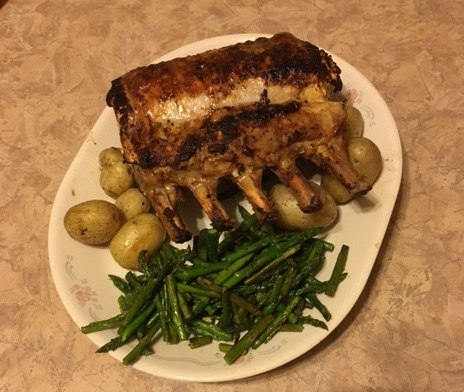 Note: I eat meat and asparagus, but don't eat the potatoes as I rarely eat proteins and starches together. 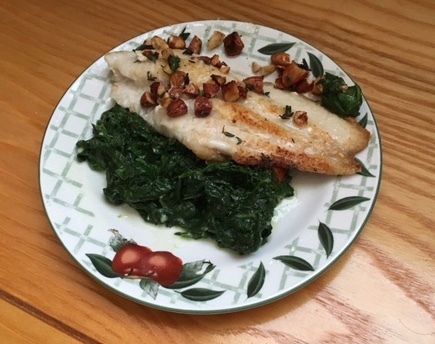 Yes, I do eat other things besides fish, but it is so easy to prepare and so healthy that I eat it often. This is a quick meal. The vegetable can be varied. I like the deep green color of spinach. Green beans is good or just a tossed salad. I do fry occasionally but only in olive oil. I use a small amount of olive oil which I heat to 180 degrees and never over 210. You can use catfish or cod or any nice white fish. I mix 1/4 c of flour with 1 c of yellow cornmeal. Add some salt and pepper. At our house we add about a teaspoon of cajun seasoning (optional). Salt and pepper the fish. Dip the fish in a bowl of milk, then into the mixed dry ingredients. Fry in a small amount of olive oil heated to between 180 degrees and 200 degrees. When fish is browned on both sides, carefully pour out most of the grease and add 2 tablespoons of melted butter. Add the juice of a lemon into the pan along with about three tablespoons of fresh thyme leaves. Then add about 3 T coarsely chopped almonds (pecans are good if you don't want to use almonds). Cook another minute or two basting fish with the sauce. Remove fish to serving dishes and spoon some sauce on top. When you cook spinach, it will shrink. It takes about 3 lbs. of fresh spinach to serve 4 to 5 people. Put a small amount of olive oil in a large skillet. Fill the skillet with spinach, but not so much that you can't stir it. Stir for about 3 minutes until the spinach is wilted. Do this until all of the spinach is cooked. Put it in a strainer and gently press out some of the liquid. Place spinach on a chopping board and chop fine. Put a small amount of olive oil in a skillet and add 1 clove of minced garlic. Cook and stir for about a minute. Add the spinach and 3 T fresh cream. Heat. If you want to add a little grated cheese of your choice, add it during the last 30 seconds of cooking. I let my family sprinkle on fresh parmesan at the table if they want it. My brother cooked this delicious meal. He put olive oil and seasonings on the salmon and cooked it on the grill. Add a tossed salad and some fresh fennel and you have a delicious meal. This was the first time I had eaten fennel so I researched it a little. I learned that fennel is a good source of vitamin C. One cup of fennel contains 10% of the daily fiber you need, 3% of the magnesium and iron. The ancient Chinese used it as a medicine for many different conditions such as upset stomach relief or conjunction. My brother seasoned the fennel with extra virgin olive oil, sea salt and lemon juice. He added a few sliced mushrooms and sprinkled with a little parmesan. It was crispy and tasty. 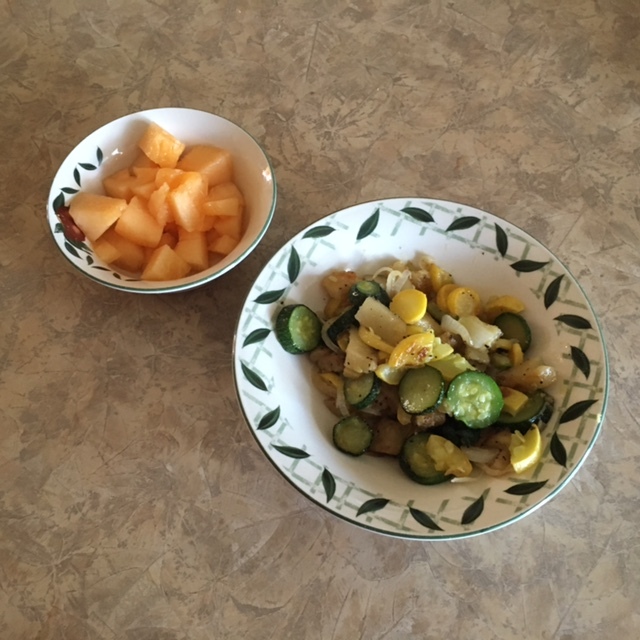 We have so much squash and onions from the garden that we often eat a meal with vegetables and fruit. Mix the vegetables with 3/4 C cornmeal (non-gmo) with about 3 T tapioca four. Stir fry over medium heat in 2 T olive oil. Cook until squash is consistency you like. If you need meat in your meal, just cook some fish or chicken fillets or add 1cup of fresh chicken which has been cut in small pieces to the stir fry. We enjoy sitting on the patio with this meal. 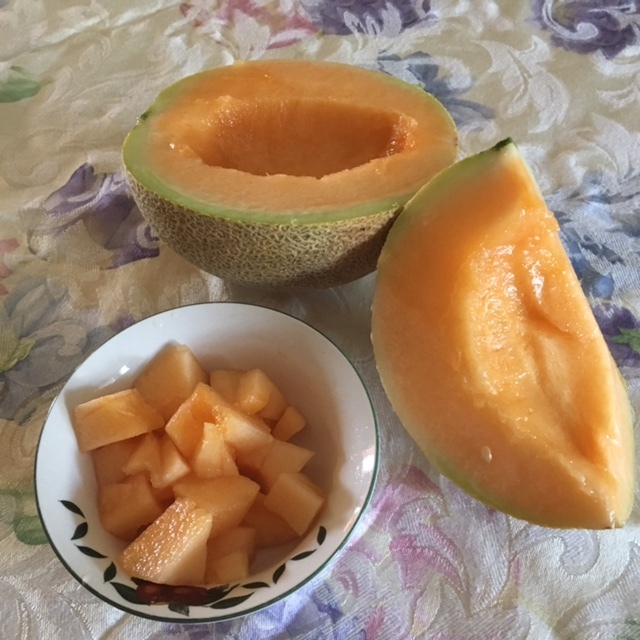 It is good in hot weather-not too heavy and quickly made. 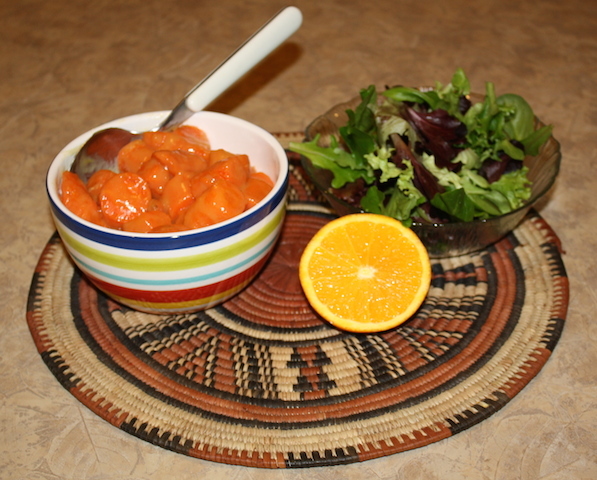 Add a bowl of your favorite summer fruit, and you will have a delicious summer meal. Well, Salmon is so good. 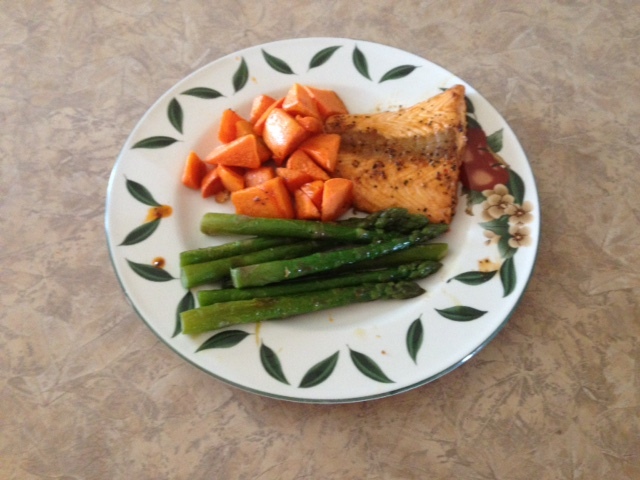 Salmon with asparagus and roasted sweet potatoes. Foods can be cooked ahead until almost done and frozen. Then when you need a quick, delicious, nutritious meal, it doesn't take long to fix. The asparagus was stir fried in a skillet with a tablespoon of olive oil. The sweet potatoes are roasted. If you roast them ahead of time and cut into pieces, all you need to do is cook them in a covered skillet until heated through. 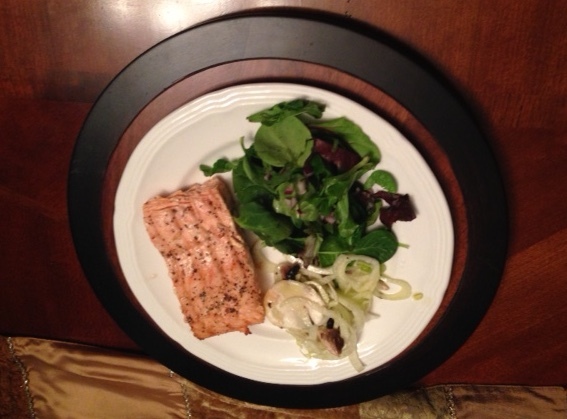 The salmon was cooked in a skillet on top of the stove. Season each food as your family likes. This is so colorful and so good. Add a glass of water and you are set. I don't usually serve bread with my meals. A good midday meal includes a salad and gingered carrots. Click picture above for recipe. Click here to see holiday eating recipes and comments. More healthy meals soon; share your menus with us also. Just click below to add your comments or menus. "A good home-cooked meal makes the family happy and content. It doesn't have to be difficult to fix."